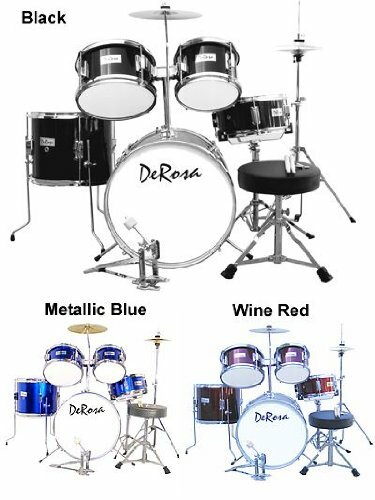 Complete drum set has everything you need to get started. Cast Cymbals: 16" ride/crash & 14" hi-hats. Heavy-duty quality double braced hardware. All toms & bass drum have 12 lugs each. Matching 8 lug wood snare drum. Good Drum Set for Display/Prop Purposes ONLY. I received this drum set, brand new in its box,on 4/8/05 .The metal pieces for the set were oxidized and rusted.Two screws were missing.One adjusting bolt for the floor tom fell off immediately.The cymbals that come with this drum set are worse than trash can lids.The drum heads are all single ply and produce horrible sound.The outer rim of the bass drum has a defect which leaves any replacing head (I've tried three) with a crease no matter how the head is tightened.The set is made in China and is shipped in a box with the drum heads on the bottom and the set on top of them.The pedals for the hi-hat and the bass drum leave much to be desired.If I had prior knowledge of the condition of this brand of set, I would have undoubtedly chosen another.I find this particular set to be sub-par in all aspects. Pearl sells the Rhythm Traveler set as a practice set that can, in a pinch, be used as a regular kit, and supplies two sets of heads for that purpose. I bought mine as a replacement for a big 1970s set of Slingerlands that took up too much space in my house, and were a pain to lug around for the occasional playing I did outside the house. (I'm mainly a guitarist and bassist, but I still like to play around on the drums, and I like to keep a set at home for jams). I tried the practice heads, but didn't like them; they don't feel much like real heads, although a lot of people do like them. Personally, I'd rather practice on a single pad. I don't care for the neoprene cymbal mufflers, either, but again, they do work. The supplied heads are on the cheap side too, but do give a good indication of how the drums sound- which is to say loud and resonant. There's a lot of tone here. I plan to replace the stock heads with some more highly damped ones, but as supplied, these drums won't sound bad in a rock gig. The hardware isn't as heavy-duty as Pearl's top stuff, but it is of uniformly high quality. It's certainly a step up from a lot of cheap import sets that sell in the same price range. I do have some concerns with the cymbal stand that also serves as a holder for the 14" tom; using my 22" heavy ride, it's hard to get that tom out from under the cymbal. Pearl also supplies a set of cymbals, but these are strictly beginner pieces. The 14" hats aren't awful, but they're not exactly K Zildjians, either. The 16" is a tinny sounding crash- not even a crash/ride- making it an odd choice to supply with the kit as the only ride cymbal. If I was a beginner that's the first thing I'd replace. I have some nice old Zildjians, so I'll be passing these cymbalson to a deserving kid, I suppose, but they're still better than the cymbals that came with my first set of drums. 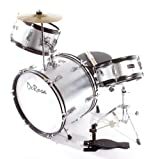 For me, the is a great little set that doesn't take up room at home, is easy to move, and with a little tuning, can sound better than a lot of bigger drums. Add a set of triggers and it would make a great electronic kit. It's also a decent practice set (although you can get a plain practice set for half the price), a good quality beginner's kit, and an excellent second kit for a drummer who already has cymbals, and is looking for a decent sounding set they can leave at the practice site or set up on a tiny stage. Most of all, what you get with the Rhythm Traveler is excellent value for the money; good drums and good hardware at a very good price. I'd recommend them without reservation for anyone looking for a good compact set. Followup: I replaced the tom heads with Evans Hydraulics, and added a felt damper to the bass.All produced huge improvments. Now when you hit the toms you get a satisfying deep sound instead of the ring the standard heads produced, and the bass has more bottom and less ring. This set is great for practice sessions with the band, when I don't want to set up my full regular kit. The sound is pretty good if you throw away the live heads that they give you and put pinstripes or hydraulics on the toms and an aquarian superkick II on the kick drum. The mesh heads are quiet with good response. The cymbals sound about as good with the mufflers on as off. Hardware is nice. Got a single chain pedal with mine! 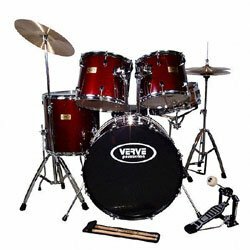 Although compact and primarily designed as a paractice set, this drum kit has a big sound and is not only an excellent practice kit, but can be used on stage. SOUND: the tom toms (10"x5", 12"x5" and 14"x5") put out a lot of sound.Because they are designed to transport stacked within each other they do not have bottom heads, which does cause some ringing.A stip of heavy tape across the bottom of the heads can cut down on the ring, but not completely eliminate it.The snare (13"x5") is resonant and warm, making it ideal for rock, but it lacks the crispness for jazz. The bass (20"x8") has a nice thump and virtually no ring. 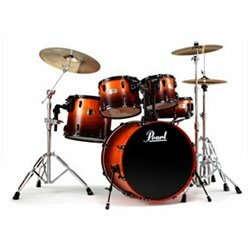 HARDWARE: Comes with solid hardware for which Pearl is known, including the following standard Pearl components - C70W cymbal stand, S70W snare stand, H70W hi hat stand, and P70 bass drum pedal.It also comes with a mount for the 14"x5" tom tom that attaches to the C70W cymbal stand. EXTRAS: The mesh drum heads have a realistic feel when you have the kit configured for practice.In addition to the mesh heads there are two "silent" cymbal pads.It takes little effort to switch from practice mode with the mesh heads to play mode with the "live heads", and the live heads are of sufficient quality that you need not change them out for a set of Remo or Evans heads to use this set for real gigs. PERFORMANCE: Good stick response on the practice and live heads.The tom toms have smaller than usual head diameters, so you may find it a bit difficult to get used to the layout of the kit at first.Also, if you are using this as a practice set you will find that moving from this smaller sized kit to a regular kit (and back) will require a bit of warm-up.It's easy to get used to the small reach required to roll from snare through the tom toms on this kit, which will make a regular kit seem like hard work when you switch back if you are getting this set for practice only. ADDITIONAL INFO: This set puts out a lot of sound.Solve the ringing problem with the tom toms with tape or your favorite technique and you can use this kit with confidence on real gigs.The hi hat and bass pedals are high quality (as you would expect from Pearl), and the other hardware is first rate. The tom toms stack within each other for easy transport, and this kit sets up fast.It also takes up very little space at home or in your practice area. I want a drum just like this and because I want to be in a band. Mom wouldn't let me have a drum and I need a drum set like it. Because I want to play my own songs and be a drummer. 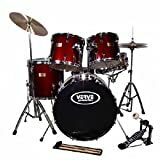 This is a solid kit that will serve the beginning-to-intermediate drummer well.The hardware is solid and stable, and the tonal quality of each drum is excellent with minimal ringing.The two critical hardware features - hi-hat stand and bass pedal - are sufficient for beginning and intermediate drummers, but are a bit unresponsive for pros. To complete this kit I recommend getting good cymbals. Any of the following cymbal packs will give this kit all of the cymbal power most drummers will need at the same value point as the drum kit itself: Sabian B8 Performance Set With Bag (ASIN B0002L54TE), Paiste 302 Plus Standard Cymbal Set (ASIN B0002D0NU2), or the Zildjian ZBT Series Basic Set Up 4 Pack (ASIN B0002CZXXA). 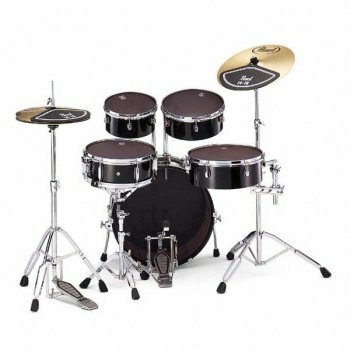 The best kept secret, though, is how easy it is to upgrade this kit to a professional quality kit that even a seasoned drummer will appreciate.Just replace the heads, which are OK for less experienced drummers, but too thin and unresponsive for professionals, with the Remo Emperor Standard ProPack (ASIN B0002F514I) and Remo Weatherking bass head (ASIN B0002E57G6), carefully tune them, and you will have a kit that sounds and plays like a high-end Ludwig kit.I also recommend that any experienced drummer select the hi-hat stand and bass pedal of their choice to bring this kit to professional standards. I use the Pearl H70W hi hat stand and P70 bass drum pedal from my Pearl Rhythm Traveler kit (ASIN B0002FO4R8). Once this kit has been upgraded as described above you will have a great five-piece drum kit that should meet your every need, and at an incredible price.While I prefer the smaller Pearl Rhythm Traveler, there are times when a full-size kit is best and this one allowed me to economically acquire a pro grade kit with minor modifications to the kit and minimum additional investment. If you are a beginner this is an outstanding kit with which to learn.The Ludwig quality is apparent, and the sound is great.You will also find a lot of flexibility in setting up your drums to meet just about any need. I appreciate the tom tom brackets that allowed me to get my toms exactly where I wanted them and at the optimum angle - this is not always easy with some kits. 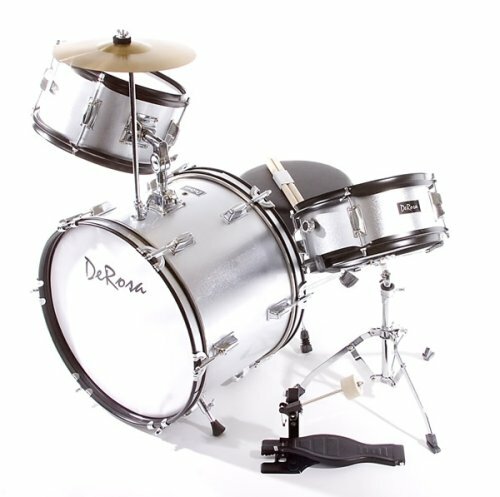 This is a solid kit that will serve the beginning-to-intermediate drummer well.The hardware is solid and stable, and the tonal quality of each drum is excellent with minimal ringing.The two critical hardware features - hi-hat stand and bass pedal - are sufficient for beginning and intermediate drummers, but are a bit unresponsive for pros. To complete this kit I recommend getting the Zildjian ZBT Basic I Cymbal Set (ASIN B0002ZO3L0) that will give this kit all of the cymbal power most drummers will need at the same value point as the drum kit itself.